Inbound marketing isn’t a tough concept to understand, but many businesses are unfamiliar with the inbound approach, especially those who are still focussed on outbound marketing or those who have no tangible marketing strategy in place. Other businesses are keen to start using Inbound for themselves but aren’t sure how to begin, or where to get the help they need. That’s why we designed our marketing strategy workshops, to help educate businesses on the power of inbound marketing and train teams on how to use inbound to improve their ongoing marketing activities. But it’s not all about processes and methods. That’s why each workshop aims to build and deliver a business-specific marketing strategy that details the opportunities available to reach more customers, and the action points required to leverage those opportunities. Why choose a marketing strategy workshop? There’s no substitute for hands-on training. 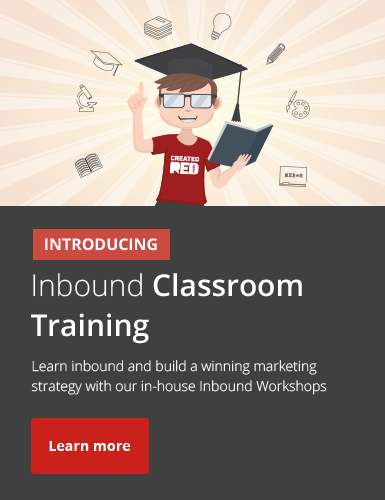 Having a dedicated period of focused study with an inbound expert will help your team understand the power of inbound marketing and develop an actionable strategy to implement inbound marketing for your own business. If inbound marketing is something your business is interested in exploring, or you want to improve your marketing in today’s digital landscape, choosing a workshop is a highly effective means of reaching your marketing goals. What’s more, our workshops are excellent value for money and offer a great alternative if you’re not ready to explore our retained marketing services. Our workshops are delivered by our HubSpot and Inbound certified team, which highlights our level of expertise and knowledge and our commitment to providing training of the highest quality. What does a marketing strategy workshop cover? Designed for focused groups within your business, our marketing strategy workshops aim to impart a detailed understanding of inbound marketing, help identify areas that could be improved, and ultimately deliver a successful marketing strategy that you can start using right away.